Sweet gum is a large tree with a long, cylindrical trunk, pyramidal crown, and corky wings on branches and twigs. Leaves are alternate, simple, star-shaped, with 5 (sometimes 7) lobes, 3–6 inches wide, deeply lobed; margin toothed, tips long-pointed; leaves slightly aromatic when bruised. Bark is brown to gray, very rough with deep grooves and narrow, slightly scaly ridges. Twigs are reddish- or yellowish-brown becoming gray, aromatic, often with corky wings on second-year’s growth; pores raised, dark. Flowers April–May, with male and female flowers on the same twig; male flowers greenish-yellow, on an upright stalk in several tight, rounded clusters; female flowers in a single, drooping, round cluster about ½ inch in diameter. Fruit matures in September–October, persists through winter; light brown, globe-shaped, formed by the union of multiple individual fruits, hard, spiny due to numerous woody, hornlike projections, 1–1½ inches in diameter. Similar species: One cultivated variety of sweet gum, L. styraciflua 'Rotundiloba', does not bear the spiny fruits that many people object to in a public landscape. Its leaves have rounded lobes. Although it produces small clusters of inconspicuous flowers in the spring, it does not (usually) set fruit. Height: to 130 feet; spread: to 60 feet. Sweet gum is a popular landscaping tree, though the many spiny fruits can be a problem for high-traffic areas. In fall, sweet gum leaves turn a variety of colors, contributing greatly to fall color in communities. In nature, sweet gum occurs in rich, moist bottomland soils in valleys and along streams. Cultivated in landscapes, it is rapid-growing, long-lived, and relatively free from insect pests and disease. A popular urban tree. The star-shaped leaves of sweet gum become even more striking in the autumn, when they turn various shades of gold, red, pink, and purple, often on the same tree. Naturally occurring populations are limited to southeastern Missouri, but sweet gum is widely planted statewide. Sweet gum is popular for landscaping, prized for its beautiful fall color. 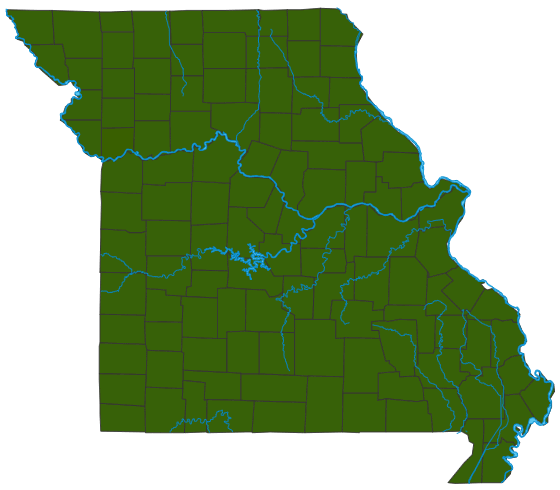 The city of St. James is called the “sweet gum capital of Missouri” for its many streets lined with the tree. The many spiny fruits, however, can be a messy problem for high-traffic areas, and on sloping sidewalks they can even create hazardous footing. A mulch bed under the tree helps. The lumber has been used for cabinetry, furniture, flooring, and interior finish. The inner bark produces a fragrant resin, called American styrax or storax, which is used in cosmetics, soaps, perfumes, and tobacco, and as a fixative in lacquers and adhesives. Historically, the hardened sap was chewed like gum for pleasure as well as for medicinal purposes. Native Americans used an infusion of the bark medicinally for diarrhea and dysentery and also in poultices for cuts, sores, and bruises. A close relative of this species that occurs in Turkey and Greece, Oriental sweet gum, provides a sap and oil that has been highly valued as an incense, fragrance, and medicine since ancient times. Sweet gum seeds are eaten by many species of birds, including goldfinch, purple finch, sparrows, mourning doves, wild turkey, northern bobwhite, and wood duck, as well as by squirrels and chipmunks. Sweet gum is a larval host plant for the beautiful luna moth. The sticky or gummy sap of sweet gums serves a purpose for the tree. As with the resins of pine and the milky latexes of dandelions and ficus plants, sweet gum's sticky sap rapidly seals over bark wounds, drying and forming a protective "scab," and the flow of the sticky, aromatic stuff can deter burrowing insects and herbivores. Have you ever noticed that sweet gum leaves gradually change shape over the summer? The earliest leaves in spring have very shallow lobes and tend to be rather small, while leaves that develop in midsummer have deeper lobes and are much larger, while late-season leaves are small again but have the deepest lobes of all. These differently shaped leaves occur as part of the tree's adaptive growth pattern. The earliest leaves, the small ones with shallow lobes, were pre-formed in buds at the end of the previous year's growing season, and they overwintered in the buds. Sweet gum's indeterminate growth pattern means that even after the spring buds open, the tree grows continuously all season long, lengthening branches and adding progressively deeper-lobed leaves until cool weather slows, shrinks, and stops leaf production. Many kinds of trees share this growth pattern, and they are typically fast-growing trees that often "invade" open areas (elms and willows, for example). Meanwhile, many other kinds of trees exhibit determinate (or fixed) growth: they only produce a set number of leaves per growing season. Ashes, hickories, oaks, and walnuts, for example, have all of the entire next season's leaves and shoots pre-formed the year before. So after their early, dramatic leafing-out in spring, that's it; after that, only buds to overwinter for next year are produced. Both development strategies optimize growth, survival, and reproduction with the tree's food reserves and environmental challenges.